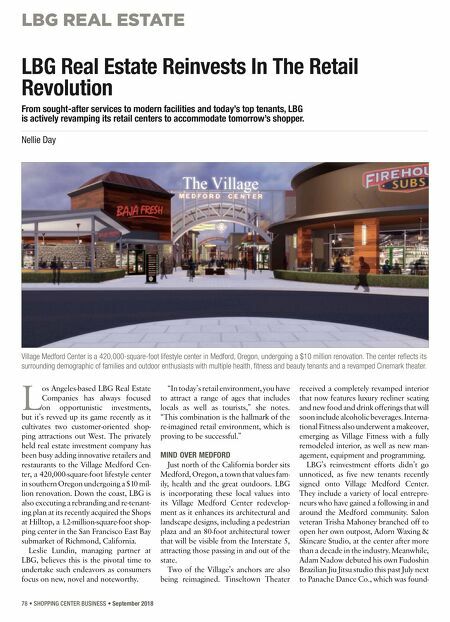 LBG REAL ESTATE 78 • SHOPPING CENTER BUSINESS • September 2018 L os Angeles-based LBG Real Estate Companies has always focused on opportunistic investments, but it's revved up its game recently as it cultivates two customer-oriented shop- ping attractions out West. 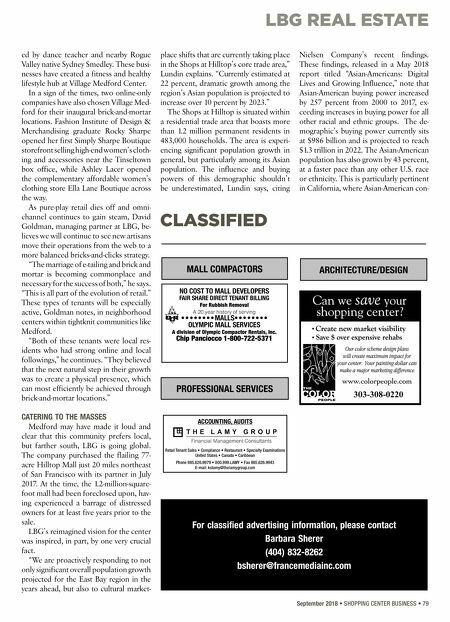 The privately held real estate investment company has been busy adding innovative retailers and restaurants to the Village Medford Cen- ter, a 420,000-square-foot lifestyle center in southern Oregon undergoing a $10 mil- lion renovation. Down the coast, LBG is also executing a rebranding and re-tenant- ing plan at its recently acquired the Shops at Hilltop, a 1.2-million-square-foot shop- ping center in the San Francisco East Bay submarket of Richmond, California. Leslie Lundin, managing partner at LBG, believes this is the pivotal time to undertake such endeavors as consumers focus on new, novel and noteworthy. "In today's retail environment, you have to attract a range of ages that includes locals as well as tourists," she notes. "This combination is the hallmark of the re-imagined retail environment, which is proving to be successful." MIND OVER MEDFORD Just north of the California border sits Medford, Oregon, a town that values fam- ily, health and the great outdoors. LBG is incorporating these local values into its Village Medford Center redevelop- ment as it enhances its architectural and landscape designs, including a pedestrian plaza and an 80-foot architectural tower that will be visible from the Interstate 5, attracting those passing in and out of the state. Two of the Village's anchors are also being reimagined. Tinseltown Theater received a completely revamped interior that now features luxury recliner seating and new food and drink offerings that will soon include alcoholic beverages. Interna- tional Fitness also underwent a makeover, emerging as Village Fitness with a fully remodeled interior, as well as new man- agement, equipment and programming. LBG's reinvestment efforts didn't go unnoticed, as five new tenants recently signed onto Village Medford Center. They include a variety of local entrepre- neurs who have gained a following in and around the Medford community. Salon veteran Trisha Mahoney branched off to open her own outpost, Adorn Waxing & Skincare Studio, at the center after more than a decade in the industry. Meanwhile, Adam Nadow debuted his own Fudoshin Brazilian Jiu Jitsu studio this past July next to Panache Dance Co., which was found- LBG Real Estate Reinvests In The Retail Revolution From sought-after services to modern facilities and today's top tenants, LBG is actively revamping its retail centers to accommodate tomorrow's shopper. Nellie Day Village Medford Center is a 420,000-square-foot lifestyle center in Medford, Oregon, undergoing a $10 million renovation. The center reflects its surrounding demographic of families and outdoor enthusiasts with multiple health, fitness and beauty tenants and a revamped Cinemark theater.